More Lego sketches! These are the mid-prequel-era Jedi star-fighters of Obi-Wan Kenobi (above) and Anakin Skywalker (below). The Obi-Wang ship actually comes with a huge ‘hyperspace ring’ (because one-man fighters this small don’t have space for an internal hyperdrive). I like the simple, sleek design, like a paper airplane, or a teeny-tiny Star Destroyer. 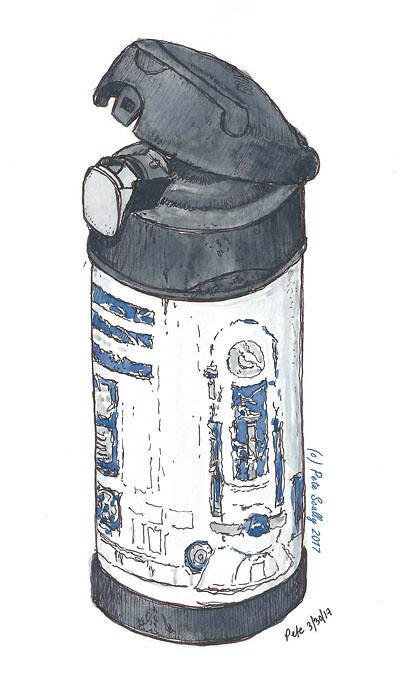 The droid, R4 (or ‘Arfour’ as in ‘Arthur Daily’) liked to deal in dodgy motors and go for a drink down the Winchester. One thing always bugged me though. 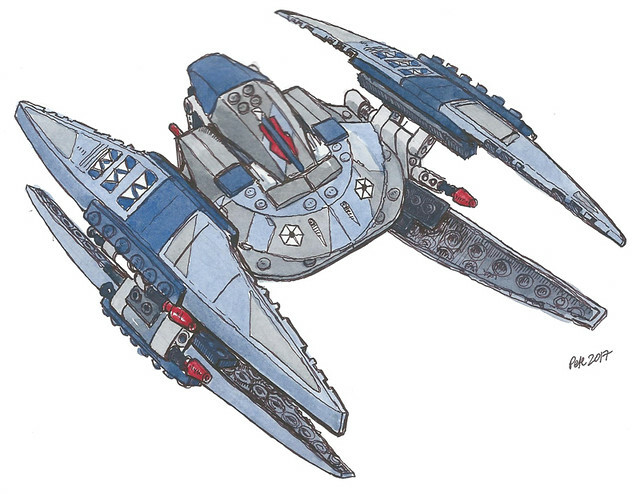 In Attack of the Clones, when Obi-Wan flies one of these to Kamino, Mace Windu orders him to apprehend Jango Fett and bring him back to Coruscant for questioning by the Jedi. But look at that ship! How’s he meant to do that? It’s not like there’s tons of room. Is he going to sit on Obi-Wan’s lap? Think, McFly, think! Anakin’s Delta 7B fighter is a similar but not identical design (Obi-Wan’s is technically a Delta-7 Aethersprite-class light interceptor). 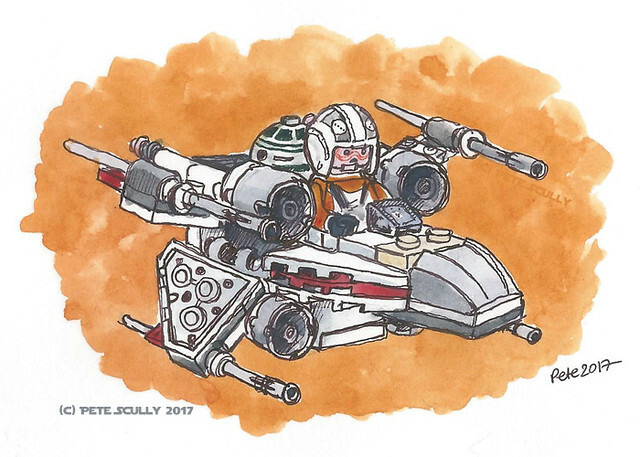 The R2 unit sits in front of the cockpit. That must be awkward as you can see, because he’s always looking sideways. He’s going to be very uncomfortable like that. 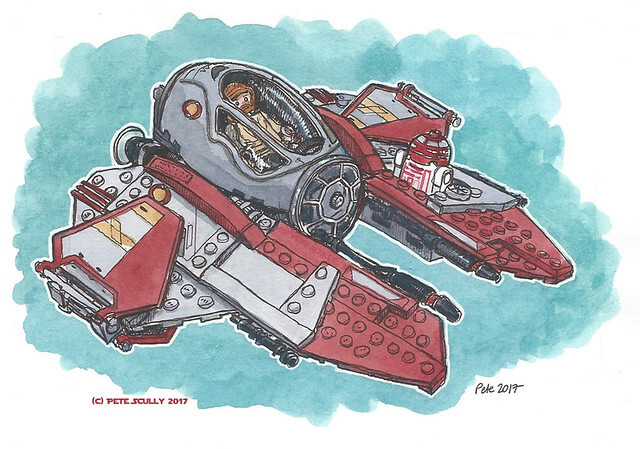 This ship didn’t appear in the movies but turned up in some of the animated media. I wish Lego had designed a more pointed nose but I suppose they didn’t want to take kids’ eyes out. 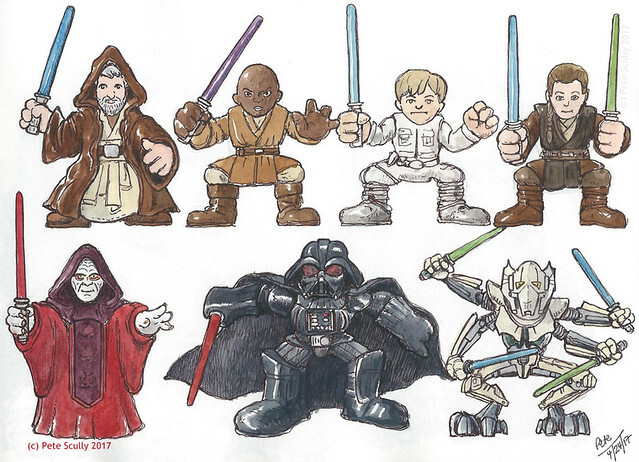 Flashback to last year…I drew their later versions, the ones flown in the opening sequence of Revenge of the Sith (which were trashed on Grievous’s starship). 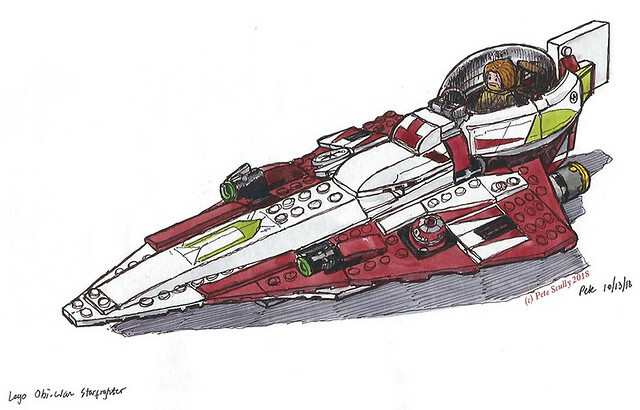 First up is Obi-Wan’s red and white (or grey here in Lego), Eta-2 Actis-class interceptor. Yeah I never knew it was called that, I looked it up. 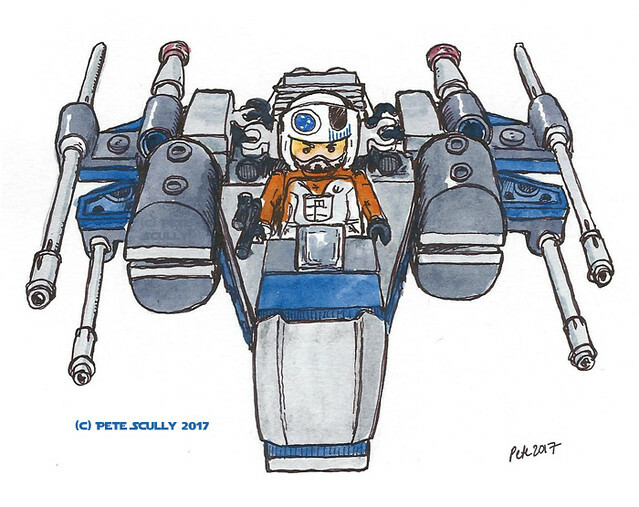 Later in the movie, when he flew to Utapau, he had a cool looking blue and white one, but he had to ditch that one too after Order 66. 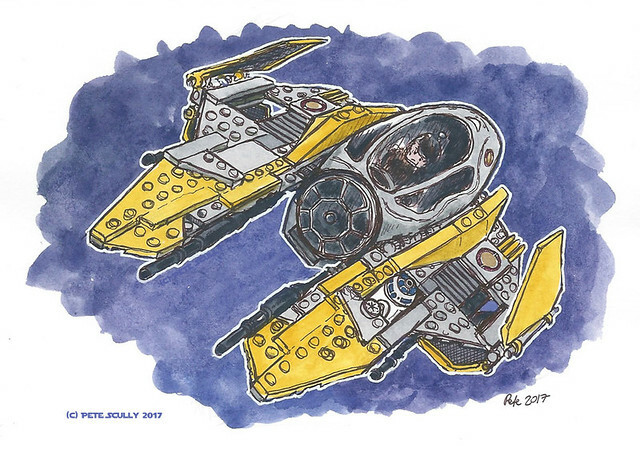 I love this design though, kind of like a B-Wing cockpit and a tie-fighter mixed with a speeder. If I lived in the Star Wars universe, this would be my vehicle of choice, you can keep your Falcons and Slave Ones and X-Wings. Well maybe I’d have this for space and a Snowspeeder for when I’m on-planet. And then there is Anakin’s one. He later flew a dark green and grey one, once he started turning to the Dark Side, abandoning his previous love of yellow vehicles. Later on, he only flew in black (or sometimes very very dark grey). You can see how this design could mould into the classic Vader TIE-fighter. I wonder what that would look like in yellow? I bet the Emperor told him he wasn’t allowed to paint it yellow, he’d ruin the Empire’s whole aesthetic. Yeah, I know. 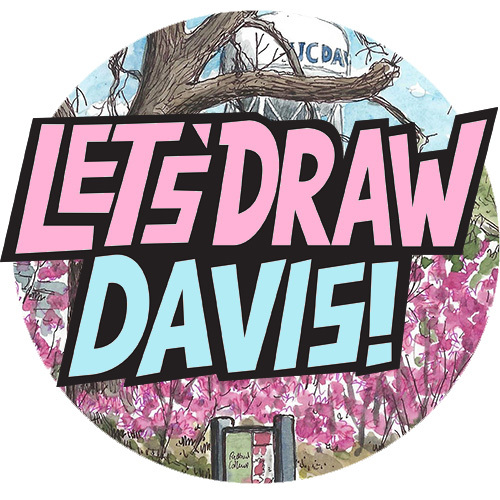 I haven’t called, I haven’t written, to be fair I haven’t sketched that much either, but this is the longest I’ve neglected my regular sketchblog since I started doing it. A mixture of being super busy (which was stressful) and being super in Hawaii (which was nice). And suddenly it is December! And I have drawn my son’s 2017 advent calendar (pictures soon). I’ve also watched and enjoyed Thor Ragnarok and, yes, even Justice League. And it is appropriate then that the first entry in this very long series of sketches you are about to see is of the Flash, who for me was a lot better than I expected him to be. Here he is. Oh right, I should explain. This is a series of drawings I did for “Inktober” 2017. What is that? Inktober is a series of prompts given out at the start of October to encourage people to draw one thing every day based on the prompt, but in ink. For 2017 they were: Swift, Divided, Poison, Underwater, and loads more. 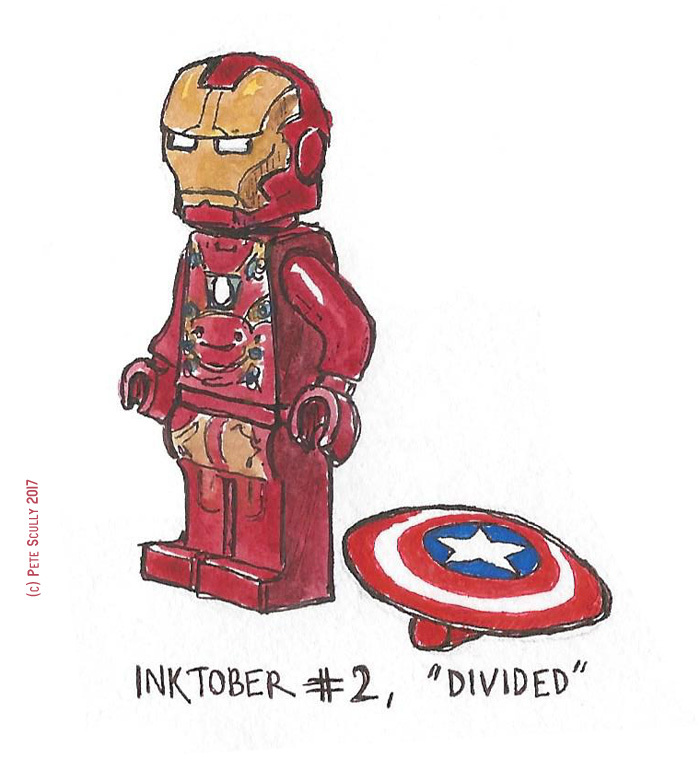 You can see the list at http://mrjakeparker.com/inktober/. Or just keep on reading and looking…. Number 2 is “Divided”, and it’s pretty obvious what is going on here. Iron Man has dropped Cap’s shield while he figures out a way to divide his collection of mugs between those suitable for tea and those for coffee. Number 3 is “Poison”. Now technically Venom isn’t poison, but when you are writhing in agony after a rattlesnake bites you the last thing you want it some eejit coming along correcting your grammar. Number 4 is “Underwater”. The Little Mermaid tends to live underwater, except for that time when she was banished for being Unworthy and couldn’t lift her mighty jewel. Perhaps I should explain all of these. 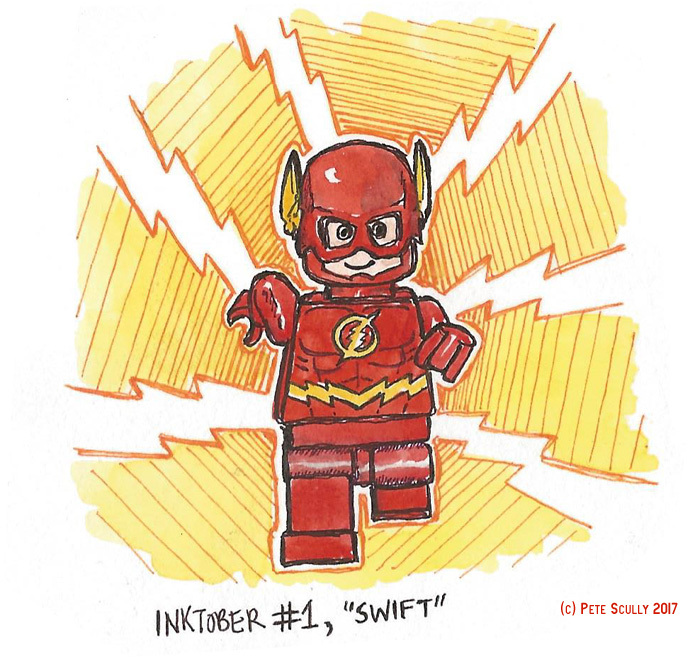 So my theme for my Inktober sketches was Lego minifigures, of which I have quite a few, mostly Marvel and Star Wars, and I love to sketch them, animate them, hide them from felines. Also, I decided that while this was all about ink drawings, I would nevertheless colour them in with some watercolour paint as well because “whatever, I do what I want”. This one is Falcon, who has very long wings. Ninjago had to get in here, huh. This is Lloyd, number 6, and yes he actually has two swords. I know the one he is holding behind his back looks a bit odd but that was the pose, get over it. Ninjas gotta ninja. Seven is ‘Shy’. Now I think Mr Lego Movie man is just a few days shy of his birthday and is freaking out about it. I did include the Palm Tree because of that whole thing with coconuts and shy, but it was, look I don’t know how coconuts work. The barrel seemed important. I love this minifigure. He’s a dandy highwayman, without the dandy. Crooked as a barrel of snakes. I couldn’t use that because I didn’t want to repeat the barrel theme. Number 10. “Gigantic”. Thanos would win this, wouldn’t he. Wouldn’t he? Well no, according to Deadpool vs Thanos by Tim Seeley, Deadpool definitely outdeaths the big purple chinned one. By the way, that trailer released this week, yes I am a little bit excited. I just hope Thanos finds his hat! He’s probably looking for it, that’s the plot of the film. I’m so looking forward to the Last Jedi, aren’t you? Not long now. Kylo Ren likes to smash things up. Afterwards he feels totally shattered. I get it. I always feel tired whenever I have to talk to people as well. I’m sure his mask doesn’t help, having to repeat himself all the time. Not sure about the red and white saltire, I think it was supposed to be X-Men related. This is the Wolverine, also known as the Logan. He is definitely fierce. He is also the best there is at what he does and what he does isn’t very nice. My wife pointed out though that he really isn’t the best there is at what he does, because if he were, he wouldn’t keep getting stabbed and shot. That actually makes him pretty rubbish at what he does. I’m like, fair point, but look at his claws. They are cool, even if they aren’t how claws work. Fifteen is the Master of the Mystic Arts himself, Doctor Stephen Strange. In this picture is is singing Peter Andre’s hit song Mysterious Girl. That stuff behind him was added in afterwards, he was singing in front of a green screen. Those things on his hands are Magic. Yeah, Comic Book Guy has a bit of a weight thing going on, I know. Sure, this is a cheap shot, I added the hot dog and soda and donut pieces (all real Lego pieces I do have), for all you know that is a low-calory Linda McCartney sausage, he could be drinking water and that donut could just be a small plate, the comic could be a book of encouragement, and that belly is drawn onto his shirt. So why this for ‘fat’, then? Because you can’t spell ‘fate’ without ‘fat’ and he is saying no, I reject my fate, I am not there yet, so ‘fat’ is just ‘fate’ but incomplete because he rejects it. That makes sense to me, because it is 1:30am after a busy week, and I am eating Pop Tarts. Am I going to do this for every one? I’ve started now so I will, as Magnus Magnusson used to say, Finnish (pretty sure he was Icelandic actually). Black Panther is pretty graceful. I can’t wait for his movie, and he was great in Civil War. WAKANDAAAAA!!!! Actually I decided against the Pop Tarts. I am not accepting my fat. One from the Lego Death Star (which by the way I have, and it is awesome). This is when they fall down the garbage chute and into the trash compactor. Hey have you heard of Palette Swap Ninja? It’s this thing on Youtube where someone has taken Sgt Pepper’s Lonely Hearts Club Band and put it against the original Star Wars film, and it totally works. Different words of course (it’s called “Princess Leia’s Stolen Death Star Plans”), and the one from this scene is Lovely Rita Meter Maid, renamed as “Dianoga Sewer Snake”. Love it! Number 19 was Cloud so we had to go to our favourite floating city in the sky, the imaginatively named Cloud City. I laugh at that but other cities have names that are also obvious, in their original (often lost) languages. London for example may have come from an old British term meaning the Hill by the Pool, Canada comes from a word meaning ‘village’, and Venice comes from the words ‘Very Nice’. That London one is disputed by the way, but that’s what I used to tell people in my old bus tour guide days as one possible explanation referring to Tower Hill, by the section of Thames called the Pool of London. I wonder if Boba Fett, when he dropped off the frozen Solo at Jabba’s palace, was all cracking up, saying “and then he goes, “I know“! Hahahaha! I’m totally using that one!” Jabba and Bib and that horrible little monkey thing are all rolling about laughing, they can’t even pick up the carbonite because they are laughing so much. 20 is another Ninjago one, this is Sensei Wu, who as all masters do, says deep stuff. I can totally relate. 21, this is Nick Angry from the Avengers movies. He has a flying car, like any badass should. 22 is “trail”, so here is a man with a map looking a bit lost. Reminds me of 17 year old Pete in the Outward Bound excursion in Cumbria, that was an experience. I was not a great navigator but I quite enjoyed being out in the wilderness. Well, the countryside, it was Cumbria, not the Canadian Rockies. Cumbria can be pretty rugged though, and the midges are about a foot long biting chunks out of your arm when you’re trying to sleep. The connection here was juice as in petrol/gas, that’s the best I could do. I love the Formula 1 Lego, and F1 itself too. Glad Hamilton won the title this year, but hope Ferrari give them a juicy old run next year. Han Solo again, this time coming out of the carbonite and unable to see, and about to be thrown into the Sarlacc, except wait! That’s Lando in disguise! Mr Cloud City himself. Tatooine just means ‘Sand World’. Luke just means ‘farm boy future jedi’. Lando on the other hand is a nickname because he actually hates the land, it’s ironic, that’s why he liked living in the clouds. It’s 2:10am and I wish I had had those pop tarts now. Squeak, well here are two of our favourite mice ever, unfortunately I drew them looking totally spaced out. Why Mickey is shirtless I didn’t ask. Spider-man! Or ‘Spider of Queens’! I LOVED ‘Homecoming’. Here he is climbing Avengers Tower. Little does he know, there is an elevator. Phil Coulson uses it in the first Avengers movie, eagle-eyed viewers will remember. Awww. They are back together. I always imagine them singing like Annie and Daddy Warbucks at the end of that film, I forget what it’s called, Orphan with Dog or something. “Together at last, together for-ev-errr”. Get this man a shield. “Found”. “Just lying in the desert”. “Fell of the back of a spaceship”. “Ben Kenobi said I could have it, m’lud”. And finally, #31. Mask. Because Luke tries to mask his obvious displeasure at seeing his father is all bald, he is thinking, oh man when I’m his age I’m probably going to be all bald too. Little did he know the opposite would be true, he’s totally hairy, stuck out on that island. Just two weeks until The Last Jedi! But for now it is 2:30am and I hope you have enjoyed this little pictorial story of a month. Well what an election night that was! I actually bowed out and didn’t watch it seat-by-seat this time, because frankly I wanted to watch Wonder Woman instead (it was pretty good). I got home just in time for them to announce the Hung Parliament, so, more fun then. Sure there’ll be another one around the corner soon. 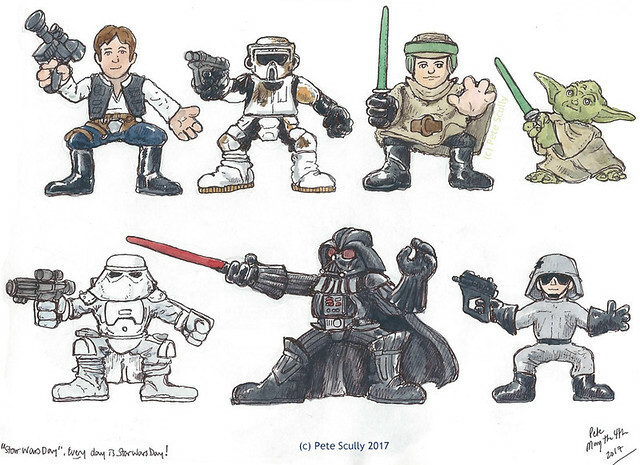 Anyway…I’m still catching up with month-old sketches, and here are a few of the old Star Wars Galactic Heroes figures I’ve had for years, the ones with the odd bow-legged stance, as if they are on the Galactic Loo. The bottom ones were drawn on Star Wars Day, May the Fourth, (for my friends in the UK, that’s on the Fifth of April). They do look like they’ve lost their seats, a whole bunch of lost seats. Nick Clegg’s, for example. I wish I had more, like the Boba Fett one, but you can’t get them any more, except on Ebay or Amazon for a lot of money. I love that Vader one on the bottom row, pointing his sabre like Errol Flynn. These were a lot of fun to draw. This near-sighted scrap-pile. This overweight glob of grease. This malfunctioning little twerp. This real bargain. This extremely well put together little droid. This subject of loose-wire jokes. This stupid lump. This feisty little one. This stupid little astromech. This devoted searcher of former masters. This a-bit-eccentric artoo unit. These rusty innards. This maker of mistakes, from time-to-time. Actually this is just a water-bottle, which has the design of everyone’s favourite little droid (or do we all like BB-8 more now?). It belongs to my son, and gets a lot of use (especially during soccer practice). 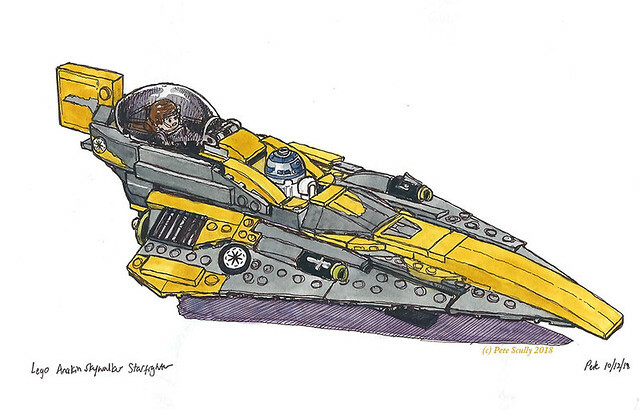 More Star Wars Lego (and this ain’t the last of it). 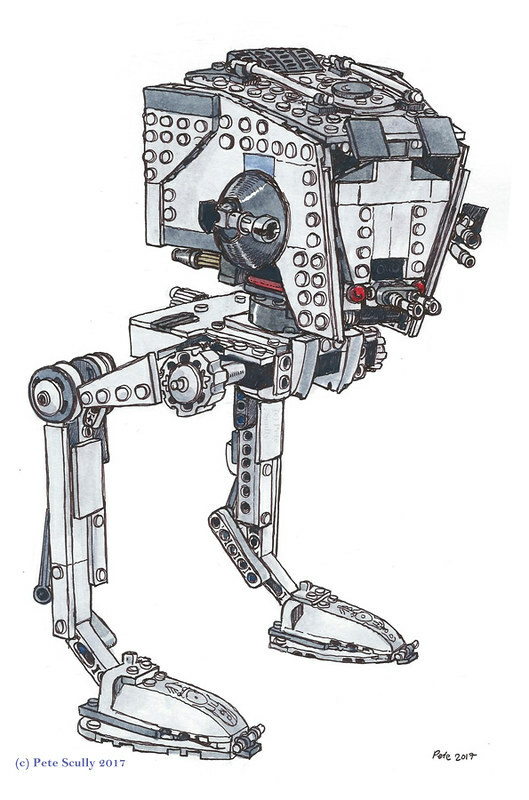 This is the AT-ST, otherwise known as the Scout Walker. Not Scott Walker as my autocorrect would say. “the Twin Suns Ain’t Gonna Shine Any More”. This is the one from Rogue One, seen briefly unless you were looking at your popcorn or literally blinking. It’s the same as the ones seen in Return of the Jedi, the ones famously useless at dealing with rolling logs. This vehicle will always remind me of getting run over at age 7 by a van outside my house. I was playing with my friends Natasha and Simon in our narrow street, my Star Wars figures all over the doorstep. We crossed over the street to see if our friends Robert and Victoria wanted to come out and play. They couldn’t; they had family visiting. Ok we said and turned to dash back over to our side of the street. My street was narrow, but cars parked on one side meant it was hard to see oncoming traffic. I was first, so I stepped into the street and woke up on the couch, covered in blood with crying and panic all around. I vaguely remember the impact knocking me out, seeing a big white blur. I think the van was white. It was probably going too fast, but it hit me head first so I have no idea. I was lucky. I spent the night in hospital, and all I had was a big beaten-up face and a black eye. But I got a new Star Wars toy as a present, which was the old Kenner AT-ST Scout Walker – Return of the Jedi had come out a few months before and was pretty much my favourite thing in the world. I remember my older sister playing with it with me, creating a terrain on the carpet by putting a blanket over several other items to create hills. There was a button on the back to make it walk. I did have an Ewok with a little glider that dropped boulders on it, as well as the Biker Scout on the Speeder Bike (which would ‘explode’ by pressing a little button on the back). My tortoises had a little brick ‘hut’ in the back garden I would pretend was the Imperial Bunker (the tortoises didn’t mind at all, I think they enjoyed being part of the story). All of this, I think of when I see the AT-ST! Hardly a trauma. I remember people asking for a couple of months afterwards, “who hit you?” It was a van, don’t worry about it. My school photos from 1983 showed a lot of scabbing and a redness in my eye. I did miss a couple of days of school. Ironically, one of my best friends in class, Wayne, also got run over on the exact same day in a separate incident. (Conspiracy theorists of 1983, get on that!). I think he was hit by a taxi. He was out of school for longer than me though, because he had broken his leg. I remember Wayne, we used to play chess and talk about animals and politics; he loved running and was good at football, he supported Everton, we both liked Sampdoria. His family were Jamaican and when he went over to Jamaica when we were 9 or 10 he brought me back this thing called a ‘Jamaican Yo-Yo’ and incredibly I STILL have it. I should find it and sketch it sometime. This was a fun set to build, and comes with (among others) Baze Malbus, the dude with the massive blaster in Rogue One who is friends with Chirrut Imwe. Those two were cool. 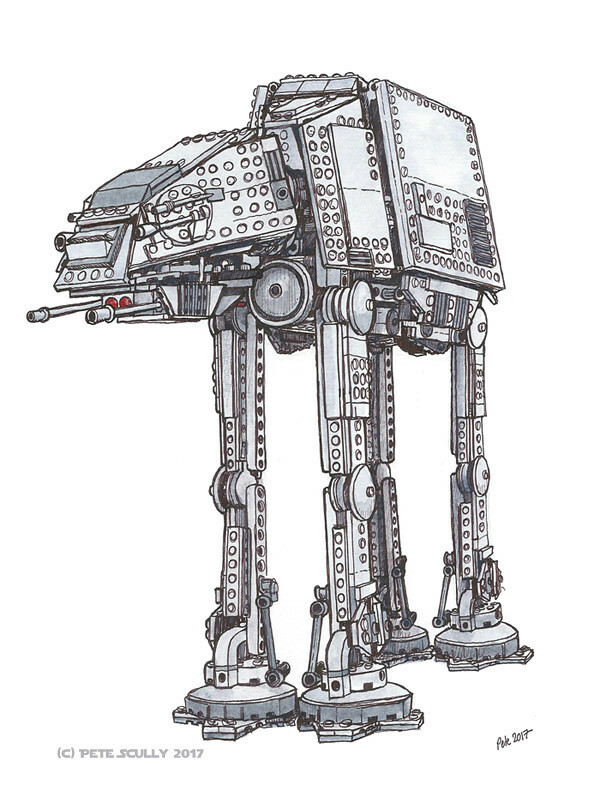 I still have a lot of Star Wars Lego sketches to show you, but here is one of my favourites so far, of the beloved Lego AT-AT. My son used to call these the “Garbage Trucks” when he was smaller, which makes sense given the sounds they make. It’s a remarkably solid construction (except the head, that tends to fall apart more easily than I’d like, I may have to reinforce it a bit) and filled with snowtroopers, who are probably my favourite stormtroopers. I’ve actually framed this and put it on the wall, in case it’s not clear I like Star Wars and Lego. Drawing objects like this are a good lesson in perspective. Drawn on Stillman and Birn ‘Alpha’ paper with brown-black uni-ball signo um-151 pen and coloured with watercolour paint. Which brings us to the classic. THIS is the X-Wing. Four engines, astromech, four big cannons, proton torpedoes, shaky cockpit, good ol’ pilot. These small one-man fighters took on the first Death Star. 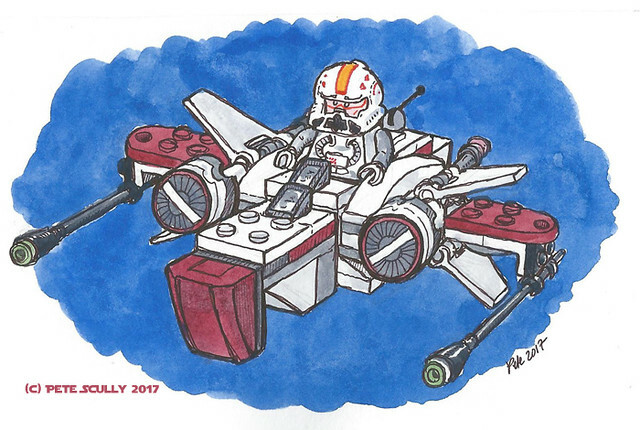 This is another micro-fighter which is about the right size for a speedy run down a narrow trench to find an exhaust port. Hah, stupid Empire not noticing that obvious design flaw, who designed that thing, what was he thinking, it’s almost like he did it deliberately. Of course it was originally thought up well before the Clone War by the Geonosians who didn’t have X-Wings in mind but, well, a lot of stuff went on after that, lot of cooks spoiling the broth (if the broth could destroy planets). Luke had the X-Wing. Red Five. I’ve already established Luke is the best, and for this reason, his X-Wing is the best one. Though I do love Porkins. Which brings us on to the Resistance/First Order era. the X0-wings of the resistance had those engines that split down the middle for some reason, being based on original designs for the X-Wing from before Star Wars was made. these are the original originals. Otherwise they are the same design, except the wings overlap differently. Poe Dameron was the best pilot, but ol’ Nien Numb, Lando’s buddy, flew one as well. That scene in The Force Awakens when the Resistance X-Wings skim across the lake on Takodana, causing the First Order to wet their white-armored pants, is one of my favourite moments in the movie. Those magnificent men in their flying machines, they went up-diddly-up-up and they went down-diddly-own-down. Now I love the prequels and all, but it’s only really Star Wars if there are X-wings vs Tie-Fighters. However I don’t just want to show off my obvious Good Guy bias here, so here is something else from the prequel era. The Vulture Droid, or “Variable Geometry Self-Propelled Battle Droid, Mark I” as nobody calls it, wasn’t a starship but a flying battle droid that could actually walk and move its head around. The Lego toy though has a battle droid that you put inside it. This first appeared in The Phantom Menace as the main bad-guy fighter facing off against the Naboo Fighter, and wasn’t called a Vulture Droid until Revenge of the Sith. I was never a big fan of this fighter, but I appreciate what the Trade Federation were trying to do. The Bad Guys in the prequels really loved their evil droids, which explains some of the anti-droid sentiment you see in the original trilogy. Now it wasn’t just evil robots who supported Count Dooku, not at all. It’s just that his was the side that had all the evil robots, and everyone else was just ok with that. It sends a bad message, Dooku, arming yourself with evil robots. Clones that turn evil later was clearly the way to go.